For our first BUILDx in Bethlehem, we were welcomed by the Museum of Natural History. The initial plan to hold the session in one of the museum’s halls spontaneously changed once we saw how lovely the setting and day were. 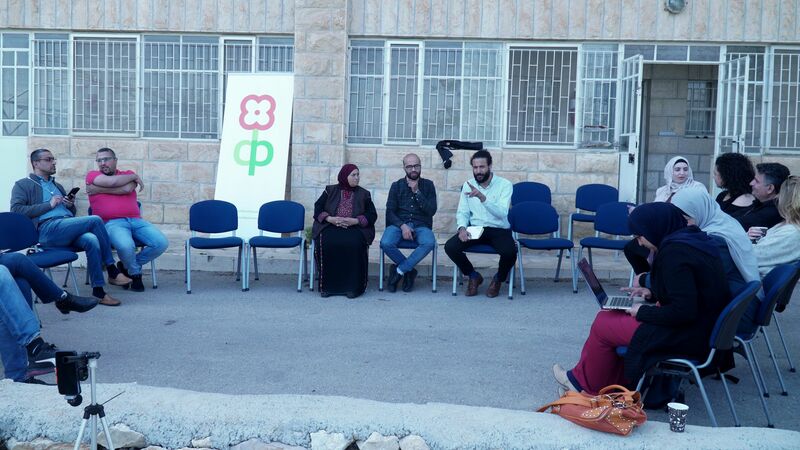 We hosted three panelists, Ala’ Hilu from Resign for Recycling Design, Fatmeh Breijieh from Ma’sarah Village Council, and Nadim Alyaseh from Shurouq Organization. The following summarizes the session’s learnings. Ala’ Hilu, founder and manager of Resign for Recycling design, talked about his experience as a social entrepreneur. Ala’ uses waste material to create and sell jewelry, clothes, furniture, and household items. Two things motivated him to work on his idea, one being his passion, and two was people’s positive reactions to his products. Ala’ aimed to change people’s perspective about waste - to see it as material that can be reused as opposed to something you solely dispose of. His project started in his backyard in January of 2013, with a personal investment. In June of the same year, he faced his first challenge; “will I continue or will I stop?” which caused him to question whether or not he should continue. Ala’ says that he didn’t always receive positive feedback on his products. On the contrary, he said that at one point, he had the support of only two people. Nevertheless, Ala’ continued to work, and to train people. Today, he’s trained over 2000 people, so of whom have become competitors of his. But Ala’ is not afraid of competition; he sees it as something positive. The more competitors he has, the more waste is reused, and the bigger an environmental impact is made. The industry he’s working in further fosters this. Fatmeh El Breijeh (Um Hasan) is the first woman to head the Local Council of Ma’sara village near Bethlehem. She’s a farmer, social entrepreneur, and an active member in her society. Um Hasan was the first person to introduce greenhouses in the Bethlehem area. She started with only one greenhouse, and expanded to 2.5 donums of land covered in greenhouses. Um Hasan planted and sold organic tomatoes. Um Hasan describes her marketing as “non-traditional”. She didn’t believe that people in local market would appreciate the quality of her organic produce, so she knocked on people’s doors instead. She soon enough had a solid customer base that appreciated her, as well as her organic product. Um Hasan is a social entrepreneur, even if she never used the term to describe herself. She saw several problems in her community, and she addressed them through the different initiatives and organizations she ran. Nadim Al Ayaseh, Program Coordinator at Shoruq organization, shared the organization’s work, and how it ties to social entrepreneurship. Shoruq is an initiative from refugees, for refugees. It was established to help refugees to raise their voices and give them a safe space for expression. Their latest work has been with a group of young female rappers who formed the band Ittijah. They provided them with the space and platform to write, record, and share their music. Their most recent music video reached over 250,000 views. The lyrics of these young women have reached global audiences. Most recently, Ettijah performed at Palestine Music Expo (PMX), a huge stage that many renowned artists perform on. Nadim believes that a crucial part of Shuroq’s work is its independence, and the control of the messages that they publish. Nadim describes the media center as an alternative and independent media outlet that empowers refugees. One thing all speakers had in mind was the support of their community, and the importance of people - Palestinians. They all work in the community, for the community, and have the support of the community.